Thank you! Check your email for a confirmation link. Add lifemadesweete[email protected] to your email contacts so that you don't miss it. Once you confirm, you'll receive a link to download the printable! 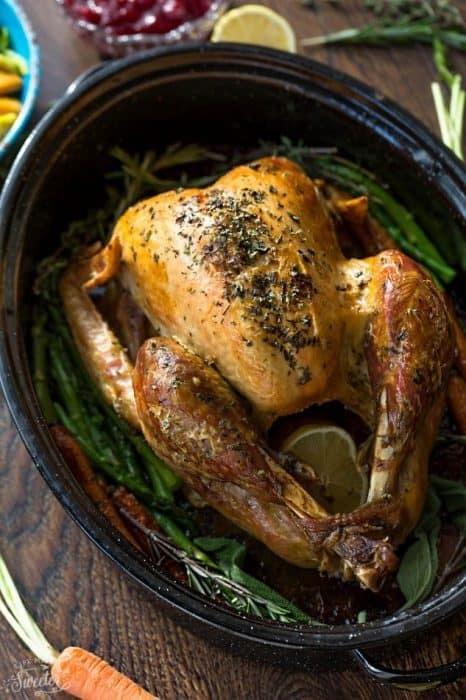 Herb Roasted Turkey with garlic – Beautifully golden, juicy, and delicious, this is my go-to no-fail roasted turkey recipe infused with a garlic butter herb rub. It’s perfect for serving a crowd at Thanksgiving or Christmas holidays & best of all, easy to customize with your favorite flavors. A big Thanksgiving holiday dinner just wouldn’t be the same without a whole roasted turkey on the table. When we were younger, my brothers and I would save our stomachs all day just waiting for the big feast. 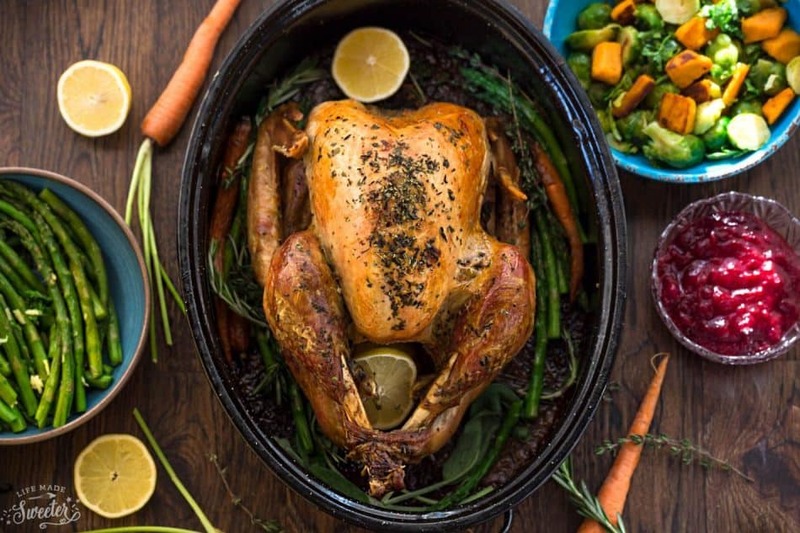 This recipe for Garlic Butter Roasted Turkey is the one we’ve been using for years. It’s a combination of notes from my mom’s recipe, food magazines, Food Network (thanks Jamie and Ina!) and cookbooks. 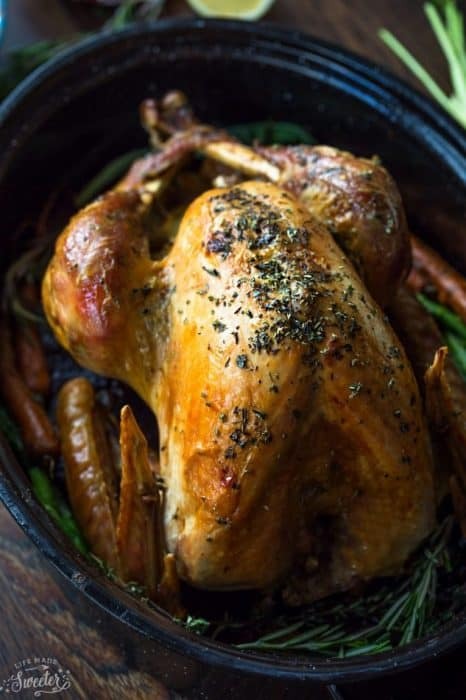 And today, I’m sharing our absolute favorite roast turkey recipe along with helpful tips and tricks on how to roast the perfect turkey that cooks up moist, juicy and flavorful every. single. time. The great thing about this recipe is that it’s gluten free, low carb and keto friendly. If you have any guests that are dairy free or following a paleo or Whole 30 diet – you can try to substitute the butter with ghee or vegan butter but I have not tried. 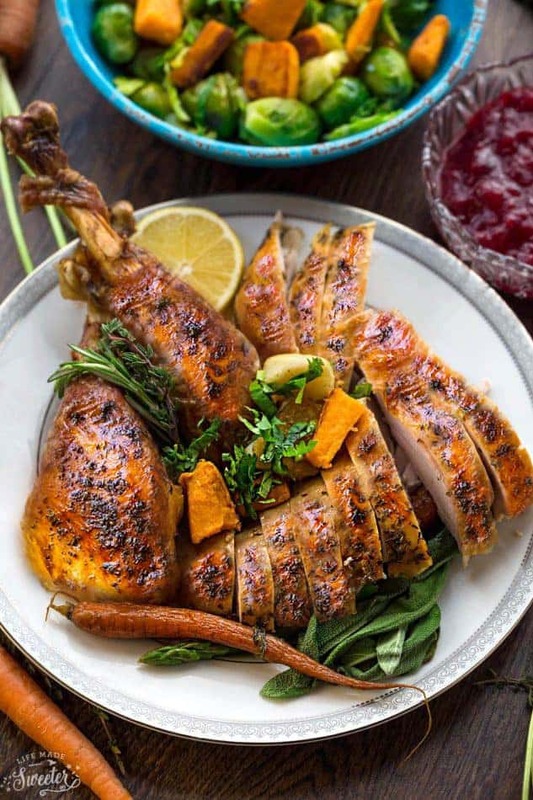 The garlic herb butter is the secret ingredient to making this thanksgiving roast turkey recipe cook up tender, juicy with the best flavors. And although I’ve seen lots of dry brine turkey and apple cider brined turkey recipes, my thanksgiving turkey recipe is simple and brine free. First off, this recipe works for either a fresh turkey or a frozen turkey. If your turkey is frozen, you’re going to need to know how to properly thaw the turkey. PLAN AHEAD: Allow 2 to 3 days for it to fully defrost in the refrigerator for a 10 pound bird. If your bird is over 13 pounds – you might want to add an extra day. remove giblets & neck, rinse & pat dry. tuck the wings underneath the turkey, using small skewers to secure, if necessary. First off, if your turkey is frozen, allow 2 to 3 days for it to fully defrost in the refrigerator. Remove giblets & neck, rinse & pat dry. MAKE THE GARLIC HERB BUTTER: In a medium bowl, combine butter, rosemary, sage, thyme, parsley, garlic, salt, and black pepper and stir together until smooth and combined. BUTTER THE SKIN UNDER THE TURKEY: Carefully loosen the skin from the turkey breast with your hands lifting and separating the meat. Do the same for the neck as well as the thighs and legs. Gently rub half of the butter under the skin using your hands and fingers and place 3 sage leaves and 2 thyme sprigs under the skin. Tie the legs together and tuck the wings underneath the turkey, using small skewers to secure, if necessary. 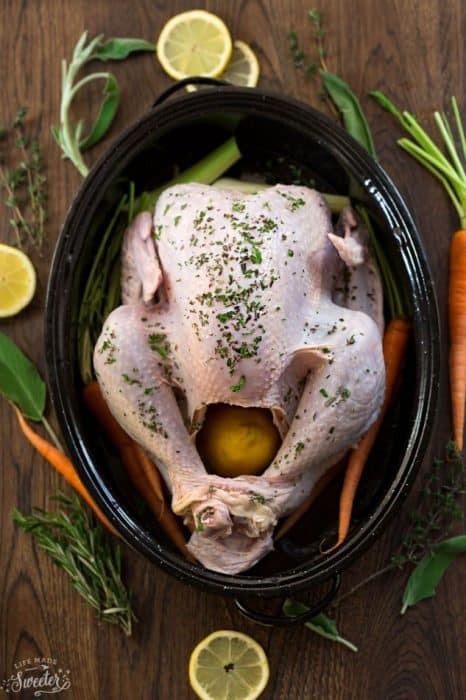 BRUSH THE OUTSIDE OF YOUR TURKEY WITH REMAINDER OF BUTTER: Place 1/3 of the onions, celery, carrots, 2 sage leaves, 2 thyme sprigs, 1 rosemary sprig and lemon halves inside the cavity of the turkey. Place turkey, breast side up in a large roasting pan. Melt the remaining butter in the microwave and brush an even layer over the skin of the turkey. Arrange remaining carrots, celery and herbs in the pan around the turkey. Pour chicken broth to the bottom of the pan (will be using liquid to baste turkey). COOK YOUR TURKEY: Preheat your oven to 425°F and position the rack on the lower third of the oven. Once the oven is ready, place the roasting pan in the oven and cook for 45 minutes. After 45 minutes, reduce the oven temperature to 350°F and continue to roast until a meat thermometer (inserted deep into the thigh but away from the bone) reads 180°F and juices in the thigh run clear when pierced with a fork, about 2 to 2 1/2 hours (or longer depending on your oven), basting with pan broth & drippings every 30 minutes. Cover loosely with foil if turkey browns too quickly. Remove turkey from the pan and onto a baking sheet and let rest for 15 minutes before carving. Strain and reserve pan juices for gravy, if desired, and discard vegetables. SO HOW LONG DO YOU ROAST A TURKEY FOR? Depending on the size of your turkey, the general rule of thumb according to USDA is 15 minutes per pound for a fresh unstuffed turkey. 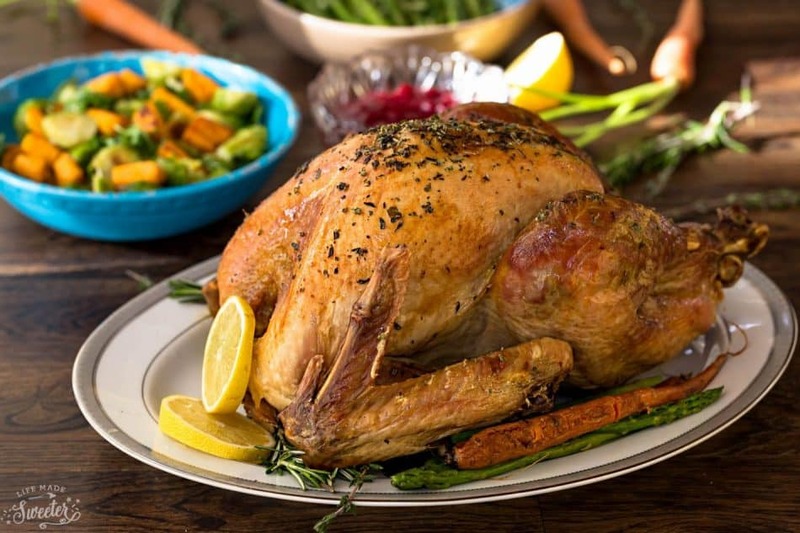 If you want to cook your turkey from frozen, then it would be 22 minutes per pound. HOW DO YOU COOK A MOIST TURKEY? WHAT’S THE BEST TEMPERATURE TO ROAST A TURKEY? We don’t’ have a convection oven and generally cook our turkey at 425 F then reduce the temperature to 350 F. This ensures the best moist and juicy turkey. The minimum internal temperature of the turkey should be 165 degrees F. Use a probe thermometer to check if the turkey is done. Insert the thermometer into the thickest part of the thigh and breast. You will want to avoid touching the bone as this will give you an inaccurate temperature. 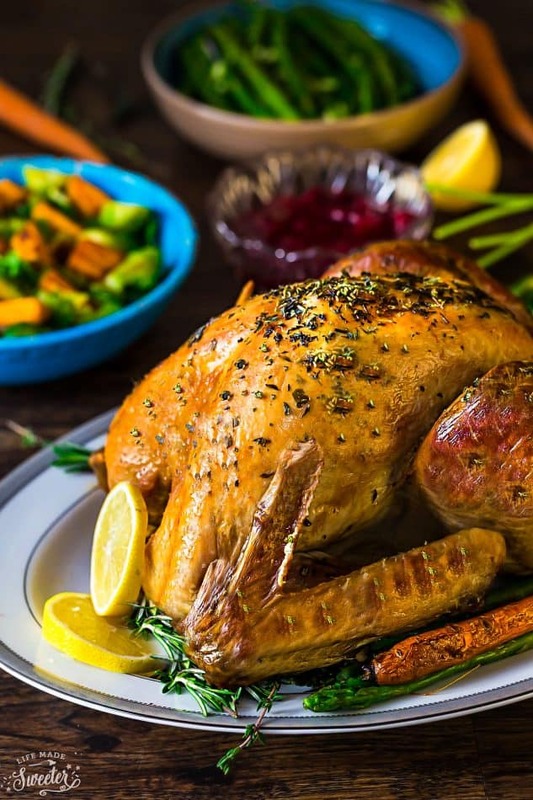 Basting – basting every 30-45 minutes using a turkey baster or large metal serving spoon keeps your turkey moist during roasting. And after you’re done making the turkey, don’t forget you can use the pan drippings to make the best turkey gravy. Once the turkey is done, pour the pan drippings through a fine mesh sieve into a bowl. Set aside. In a large saucepan over medium-low heat, melt 1/4 cup butter. Slowly whisk in flour until smooth, whisking constantly, until mixture is smooth and bubbly. Whisk in pan drippings, then slowly add broth (a little bit at a time) as needed to thin out gravy. Heat to boiling, stirring constantly. Boil and stir 1 minute. Taste and season with salt and pepper as needed. 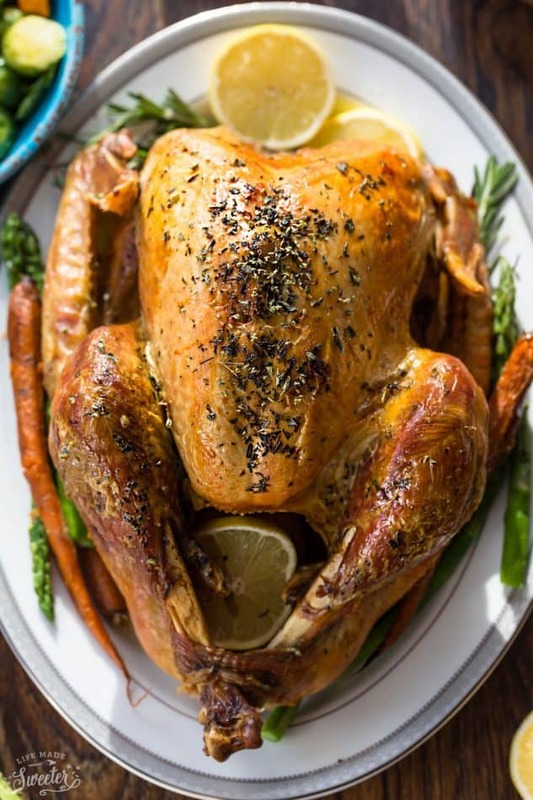 Best Thanksgiving turkey - easy tips and tricks on how to make the perfect turkey for your family for Thanksgiving or any Christmas holiday gatherings. Herbs, garlic, and butter for a crowd-pleasing favorite. Allow 2 to 3 days for it to fully defrost in the refrigerator. Remove giblets & neck, rinse & pat dry. In a medium bowl, combine butter, rosemary, sage, thyme, parsley, garlic, salt, and black pepper. Stir together until smooth and combined. Place 1/3 of the onions, celery, carrots, 2 sage leaves, 2 thyme sprigs, 1 rosemary sprig and lemon halves inside the cavity of the turkey. Place turkey, breast side up in a large roasting pan. Melt the remaining butter in the microwave and brush an even layer over the skin of the turkey. Arrange remaining carrots, celery and herbs in the pan around the turkey. Pour chicken broth in the bottom of the roasting pan (will be using liquid to baste turkey). Preheat oven to 425°F and position rack on lower third of the oven. 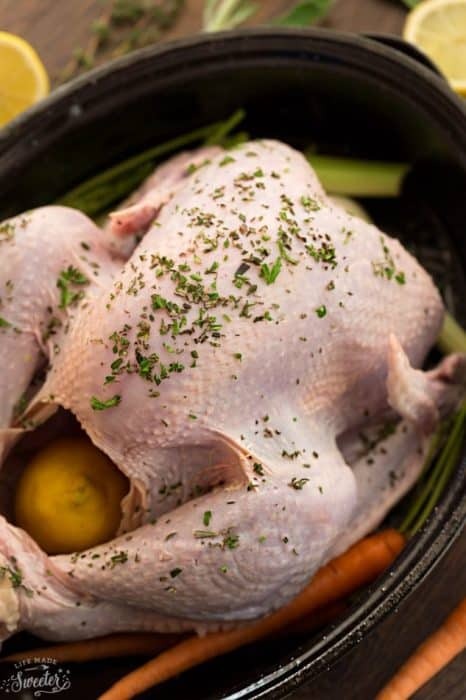 Once the oven is ready, place the roasting pan with the turkey into the oven and cook for 45 minutes uncovered. After 45 minutes, reduce the oven temperature to 350°F and continue to roast until a meat thermometer (inserted deep into the thigh but away from the bone) reads 180°F and juices in the thigh run clear when pierced with a fork, about 2 to 2.5 hours (or longer depending on your oven and size of your turkey), basting with pan broth & drippings every 30 minutes. Cover loosely with foil the last 30 minutes of cooking or if turkey browns too quickly. Once the turkey is done, remove pan from oven. Carefully transfer turkey from the pan onto a baking sheet and allow to rest for 15 minutes before carving. Strain and reserve pan juices for gravy, if desired, and discard vegetables. o that bird is perfectly roasted! Awesome colour and so flavoursome. What a gorgeous bird, Kelly! Love that perfectly golden skin! This is such a stunner! We are hosting this year and the garlic herb butter sounds amazing!! Beautiful job! What a fun tradition to have turkey every year, Kelly! And hooray for nailing it the first time you made it! This garlic herb version looks just perfect. I could put garlic in just about anything, so I’m loving this flavorful dish. Looks SO good! Oh my goodness, now this is the type of big bird that makes my heart go pitter patter! This turkey looks just perfect, Kelly! Golden brown, delicious and just packed with flavor!! LOVE that garlic-herb butter! Seriously, I could eat this entire turkey myself. <3 Cheers friend! That’s one fine looking bird, my friend! That looks like one perfectly cooked turkey! Love that story about you cooking turkey for the first time. I know what you mean. There is always some anxiety cooking for people, especially the first time in a major way. This looks marvelous. What a perfect looking turkey! The garlic herb butter sounds amazing! This is gorgeous!! And it looks so doable! Awesome Kelly! I was a complete wreck the first time I made the turkey too, and even subsequent years…it took me a while to feel confident only doing it once a year! 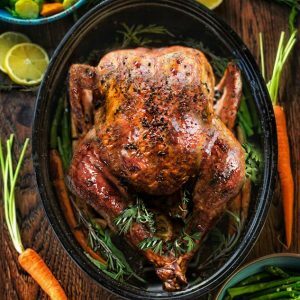 This turkey is golden brown perfection and I love the citrus and herbs — this is a show stopping bird! My hubby would love this, I may try all that flavouring on his Christmas turkey. what do you do with the 4 cups of chicken broth – I did not see it menitoned in the instructions above? In #4 , she says put chicken broth in bottom of your pan. This will end up as part of your gravy. This was seriously amazing!! Thank you so much for such a great recipe! Our entire family kept asking for thirds and the recipe! This seems delicious, I haven’t cooked Turkey before. When it is Christmas, I would like to try one as your recipe.Yummy. Hi Theresa, yes, you can use ground spices – I’ve never tried but yes – you can use 1 1/2 teaspoons of each spice and for ground parsley you would use 1 teaspoon. Hope that helps, good luck!